Erin from Housepeeping is a real estate genius who is based in the Houston area. . . but don't let the location deter you from checking out her blog! She has great tips for buyers and sellers world wide AND she takes you inside some pretty amazing houses! Wynne and Stephen, from Gloriously Ruined, are waiting for their son, Camp, whom they are in the process of adopting from Ethiopia! 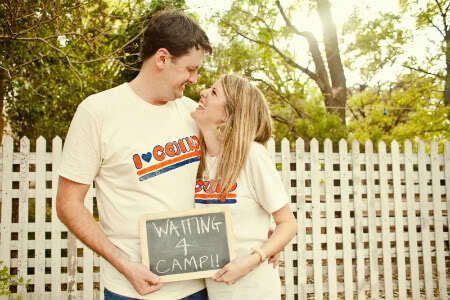 These precious t-shirts come in adult and child sizes and help offset the cost of the adoption. One custom onesie or t-shirt of your choice! Sarah from Racing Towards Joy blogs about faith, life, and family! She is "real," doesn't pretend to have it all together, and she blesses me daily! 8 Visit Him and Her Plus Four's Etsy Shop and tell me which design is your favorite! 14. 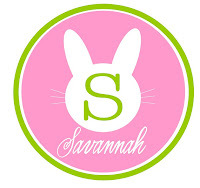 You have Elizabeth Ann's Recipe Box on your blog roll! 15. 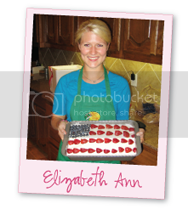 You have Elizabeth Ann's Recipe Box button on your blog! 16. Tag something from Elizabeth Ann's Recipe Box on Pinterest! The Quadruple Giveaway ends at midnight on Monday, March 2nd. I'm a new follower, thanks for the chance to win! Eeek I want to win!!! I follow ! You're on my personal blog's blog roll too. Hope I can count that twice! I follow racing towards joy!! Fun! I follow your blog. And I have your blog on my blog roll! And I just followed you on pinterest! I'm definitely a follower of EARB! And I just tagged of my favorite recipes of yours on pinterest! I tagged your brownie Easter baskets! I now follow gloriously ruined! I now follow Hin and Her + 4! I subscribed to racing towards joy! I LOVE the 3 letter circle monogram on H&h+4! I would order the onesie for our sweet baby boy arriving in June!! I liked housepeeping on FB! Following your blog! How was I not before??????????????????! following racing towards joy... LOVE sarah!!! Visited him and her plus four's shop and my favorite item is the personalized three letter monogram! Visited the etsy shop and love the personalized little hearts valentine tshirt design! And I follow your Facebook! Just figured out how to "stumble upon" and stumbled upon this post!